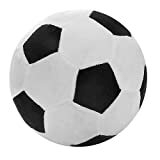 ⚽SOFTNESS AND PERFECT GIFT - Soccer Ball Pillows Handcrafted With Soft Plush Materials Safety To Throw Around Without Fear Of Breakage Anything Or Your Lovely Children Get Injury. 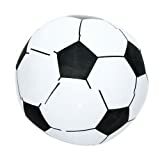 Great For Your Little Kids Indoor Soccer Practice. Feature Adorable Silky Plush And Soft Huggable Bodies Brings A Smile To Your Children Ideal Gift At Any Occasion. Birthdays, Anniversaries, Valentine And Christmas! ➤ Appropriate For Ages 3 And Up. ➤ Each Ball Measures Approximate 8" In Diameter. 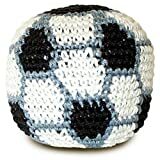 ➤ Careful Stitching Each Edge Of Fabric Makes Football Ball Superb. ➤ Stuffed Football Plush Just Perfect Ball Toy For Your Young Athletes! ➤ Handcrafted With Soft Plush Materials Safety To Throw Around Without Fear Of Breakage Anything Or Your Lovely Children Get Injury. 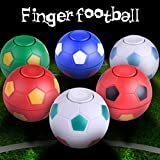 ➤ Great For Your Little Kids Indoor Soccer Practice. Perfect For Kicking And Throwing Around! Excellent For Children Indoor And Even Outdoor Play. ➤ Products Made Of High Quality Filled With Pp Cotton Surface Washable For Easy Cleaning. Simply Tossing It In The Washing Machine And Dryer And It Fluffs Right Up.